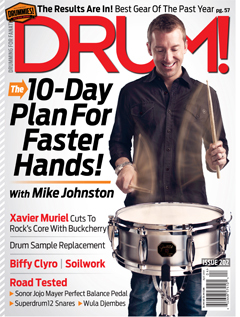 Judging by this check I just received in the mail, I apparently have an article in the April, 2013 issue of Drum! Magazine— my third. Hopefully that’s still in the stores. The piece is my transcription of Vinnie Colaiuta’s playing on the guitar solo from Frank Zappa’s Keep It Greasey, in 19/16, along with a short analysis and tutorial on how to approach playing in that crazy meter. My previous Drum! pieces are available on line, too.